i. Any authorized person holding a legal power of attorney in case the individual is incapable of signing the I-T Return or is absent from India. 2. 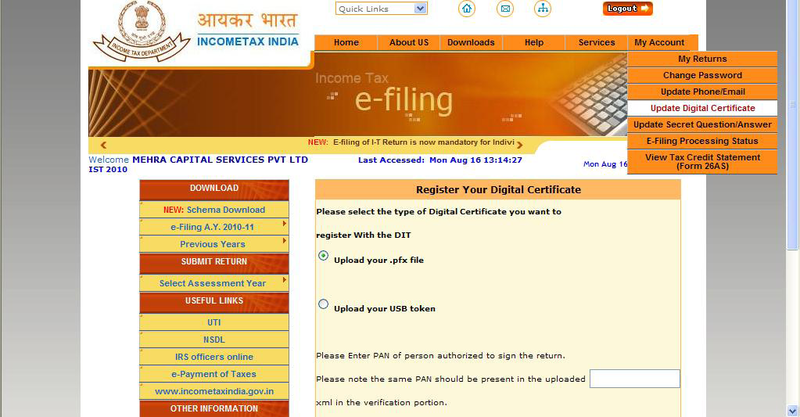 Any person wishing to sign the I-T Return digitally has to complete the registration process for the DSC on the e-filing website- http://incometaxindiaefiling.gov.in prior to signing. 3. Any person could register his DSC to be used to sign the I-T Return of any entity provided he was a Director or Partner or Key Person as mentioned in the Key person Schedule of the I-T Return (ITRs 5 or 6) already filed electronically with the Income Tax Department. 4. Any person could register a DSC and use the same in his individual capacity to sign his own IT Return as well as sign the I-T returns in his various capacities as mentioned in 1 above, if required, and for as many entities as applicable. 5. Any person could change or update his DSC registration any number of times. 1. 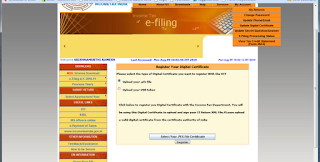 The authorized signatory / Individual would log into the E-filing websitehttp://incometaxindiaefiling.gov.in using the Login particulars such as the userid and password of the company / firm / HUF / Individual etc. 3. The taxpayer has to select the appropriate type of DSC (.pfx or USB token) and click on ‘Select Your .PFX File Certificate’. At this stage, the Department would verify if the person holding the DSC matches the Director / Partner / Key Person in the Key Person Schedule of the Company (ITR-6) or Firm etc (ITR-5). If there is a match, i.e. the person registering the DSC is mentioned as a Director / Partner / Key Person, then the DSC would be registered against the Company / Firm / Entity PAN and the critical details such as the Sl no, Name etc would be stored. In this process, it is essential that at least one earlier I-T Return should have been filed by the Company / Firm / Entity so that the verification of key person is possible. 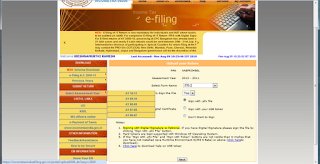 In case an individual is registering the DSC for his own ITR (ITRs 1-4 case), then the email id as mentioned in the DSC should match the email id as per his registered profile in the efiling website. Now, the I-T Return for the Individual/HUF/Company / Firm / Entity PAN can be signed using this registered DSC. 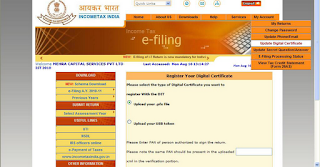 only then the I-T Return is permitted to be signed and uploaded. (See webpage below- circled portions-> Select ‘Submit return’-> ‘AY 2010-11’ for submitting I-T return for AY 2010-11 and then select ‘Do you want to Digitally Sign the file’ -> ‘Yes’. Select appropriate type of DSC (.pfx or USB token) and click on ‘Next’ to proceed further to enter the DSC password and sign and upload the I-T return. 1. Non-resident companies where the Directors are foreign nationals. 3. Companies where the Managing Director has changed and other Directors are either unavailable or also have changed. In all such cases it is difficult to verify the identity of the person and his relationship with the Entity for which he is the authorized signatory. With a view to make registration simpler in such cases, the procedure has been changed to enable registration of a DSC where the PAN is also provided in the DSC as per the latest Interoperability guidelines issued by the Chief Controller of Certifying Authorities. Such DSCs with encrypted value of PAN are now available in the market. Refer to the new guidelines for DSC Interoperability issued by the CCA, Government of India in http://cca.gov.in/rw/resource/dsc_guidelines_r2.pdf?download=true wherein the Permanent Account Number (PAN) has been included in an encrypted format as an attribute . a. The Authorized Signatory must use a fresh DSC having encrypted value of his PAN, as issued by Certifying Authorities with effect from 01/08/2010. b. Enter Authorized Signatory’s PAN number while registering the DSC. The same person must also enter the same PAN in the Verification portion of the I-T Return which he is signing in his capacity as Director/ Partner/Karta/Authorized Signatory. c. If the Authorized Signatory PAN number matches the encrypted value of the PAN present in the DSC – then the DSC will be registered after selecting the appropriate type of DSC (.pfx or USB token) and clicking on ‘Select Your .PFX File Certificate’. d. In case of an Individual is registering his DSC for submitting own ITR (ITRs 1-4 case) then his PAN as per his login should match the encrypted PAN contained in the DSC- then the DSC will be registered after selecting the appropriate type of DSC (.pfx or USB token) and clicking on ‘Select Your .PFX File Certificate’. e. Now, the I-T Return for the Self / Company / Firm / Entity PAN can be signed using this registered DSC.